The final curtain has closed on this year’s Close Protection Conference (CPC), hosted and managed by the International Protective Security Board (IPSB). Sitting here in a post-education/networking hangover (still in Vegas), we wanted to share our thoughts on this weekend’s event. If you are uninitiated or uninformed about the IPSB (shame on you! ), we’ll catch you up. IPSB is a non-profit, 501(3)c organization founded in 2016. 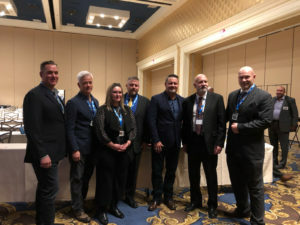 Its all-volunteer board is a who’s-who of industry leaders; Kristin Lenardson (Capital One), Chuck Randolph (Microsoft), Chuck Tobin (At-Risk), Christian West (AS-Solution), Pete Dordal (GardaWorld), Jerry Heying (EPI) and Fonda Delcamp (ESI). I challenge you to find a more holistic and robust representation of leaders that directly impact all aspects of the protective security industry! for the Protective Security industry. Offer and/or facilitate Protective Security professional development and continuing education. Promote the Protective Security industry with existing and future markets. Research and educate the Protective Security industry and its practices. Sound impressive? It should. 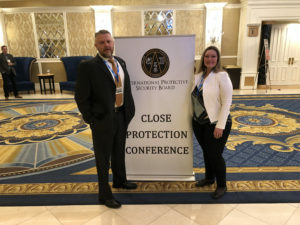 More applicable to this post, IPSB hosts a gathering of security professionals every year called the Close Protection Conference (CPC). 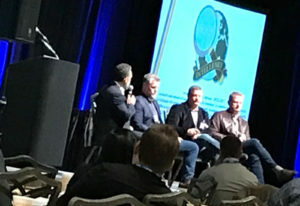 The inaugural event was held in 2016 and was a watershed moment for protectors who have struggled to find their unique voice in the bigger security conferences with a broader focus. Each year the conference has become more focused, more honed-in on their core missions, better run, and better attended. This year was no exception. 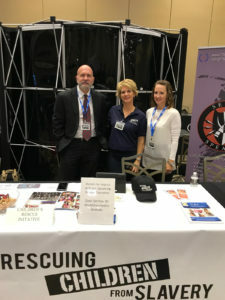 On/about December 29th, nearly 400 protection professionals descended on Las Vegas to attend the 2018 CPC. Yes, there was a shooting competition held prior to the official conference kick-off that had people there early, but 7Spears arrived with the rest of the herd. We did hear that the competition was stiff at the range and there were many liquid refreshments used to bolster (or sooth) the ego’s affected by the results! Bragging rights for the next 12 months were solidified, and bonds were irrevocably strengthened. Networking events. Our hands are still sore from shaking so many hands at these events! And we’re out of business cards. Different from similar events at more “stuffy” environments, the attendees at the 2018 event were approachable, friendly, and very willing to engage in meaningful conversations with anyone in the room. Given the caliber of attendees, this is significant. A special shout-out here is much deserved for IPSB President, Kristin, who spent time having meaningful conversation with every. single. attendee. This is unheard of in nearly any arena. 7Spears can only speak from personal experience, but friendships were renewed, new bonds formed, and actual business was done at these nightly events. This alone was worth the price of admission to the conference. Presentations. A common theme throughout the IPSB experience was that there was no waste or fluff. What we mean by that is that every aspect was DIRECTLY applicable to some aspect of the protector lifestyle or job requirement. The presentations were a prime example of this. 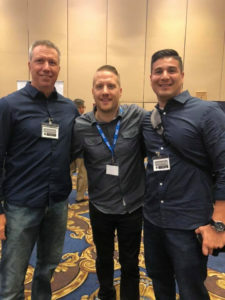 Whether an attendee worked in the finance, celebrity, high-net worth family, corporate, or some other aspect of the protective security space, there was a take-away in every presentation for everyone. But the many panel discussions and tac-talks pushed this concept to the next level as they combined different sectors to identify and analyze common challenges, needs, or solutions that were applicable to everyone in the room. Kudos to all of the presenters who volunteered their time, information, and expertise to better the group as a whole. Exhibitors. Again, every vendor in the expo hall provided products or services that directly applied to the protector life. We wandered the expo hall for several hours – not because the expo hall was that big – but because the vendors we encountered were much more interested in making relationships than making a sale. And that, my friends, is a recipe for success in our book. Career Event. Something we absolutely love about the CPC conference is that they pay particular attention and have a special focus to industry newcomers. Given our work as instructors at Executive Security International, this issue is near-and-dear to our heart. We always encourage our students to come to the event and (from our post-conference check-in’s), they never leave disappointed. Attendees have direct access to actual hiring managers and recruiters who are actively looking for quality candidates. IPSB helps those looking for employment with a career event where resumes are reviewed, mock interviews conducted, headshots taken, etc. Such care and feeding of our industry’s future generation is unheard of anywhere else. We know that a few of our students actually left that conference with job offers. Amazing. We would be remiss if we didn’t mention (and thank) all the IPSB volunteers that worked tirelessly behind the scenes to make this conference run smoothly. This army of selfless service was small but mighty. There HAD to have been some hiccups or things that didn’t go as planned, but it was transparent to us as attendees. By any measure, that is the greatest marker for success. Protectors with a heart. More than anything else (at least for us), the defining moment of the entire conference focused on the magic we witnessed when an entire sector of this industry came together in support of a common cause. 7Spears attended this year’s conference as a sponsor of our Corporate Social Responsibility (CSR) project, The Children’s Rescue Initiative (CRI). IPSB was gracious enough to give CRI a booth in the expo hall and allow us to give a 30-minute tac-talk during Day 1 of the conference. Prior to attending, we had an executive board meeting to lay out our goals for the conference. 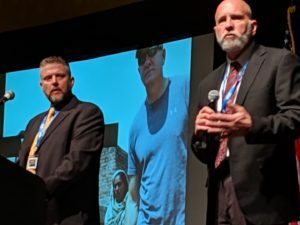 It was simple: raise awareness to the issue of human trafficking and slavery and tie that awareness back into the important role that protection professionals play in combatting this global epidemic. We had no idea what was in store for us. We could tell that our presentation was impactful. It is hard to turn away from a problem that speaks so directly to our humanity and the definition of innocence. Put that issue in front of a room full of protectors, and the impact increases tenfold. But what happened next shocked us. At the end of our presentation, one of the conference attendees asked Bruce Ladebu (President/Founder of CRI) what was needed in terms of finances for our impending rescue mission. This was an unsolicited question that took us a bit by surprise. When Bruce shared that we were several thousand dollars short of what we needed, you felt an electric buzz spread across the room. A tidal wave of encouragement, and “sense of team” washed over us on stage. No, that’s not quite accurate…it was more a “sense of family” and common purpose that smacked us in the face. We spent the rest of the conference in a shocked state of dazed humility as the outpouring of support, encouragement, and yes…financial support surpassed any of our wildest expectations. person that came up to us and shared a personal story of how human trafficking has impacted them, made a contribution, or signed up to help us was a special event. We cherished them all. We will say that we saw the powerful impact of what a room of high caliber people like that can do. Our next rescue mission is now fully funded and we are well on our way to funding the next one. We also made several strategic partnerships with organizations who are going to add capability or capacity to CRI. We hesitate to name names because it was obvious that these heroes didn’t do what they did for the credit. But those in attendance know who you are, and you will now and forever be an integral part of the CRI family. Saying Thank You will never be enough, but we made a promise that we will be providing this esteemed group special updates to see EXACTLY the impacts of their generosity. 7Spears will keep that promise, brothers and sisters. We will give a special shout-out to ESI for introducing CRI to IPSB and for IPSB agreeing to host CRI. You facilitated an event and set the stage for your members to make magic happen. And BOY, did your members show up! So there you have it. Another successful event in the books for IPSB. Each board member will probably take the opportunity to have a small break and enjoy the holidays and their “day jobs” for a week or two. Starting in January, they’ll likely begin planning for CPC 2019. Can they make magic happen again next year? Not sure…but we ARE sure we’ll be there to find out! As one of the Founding Board members of the IPSB I can say we were very pleased to have you present at the CPC and have a both. I also thought it was impressive of the amount of money that was raised in a spontaneous auction. Good luck with your heartfelt mission. Jerry Heying, Executive Protection Institute.